What’s Your New Year’s Good Luck Tradition? We have our traditions of starting off the New Year with eating lucky foods. At midnight, we follow the Mexican/Spanish tradition of eating 12 grapes, one for each month of the New Year. 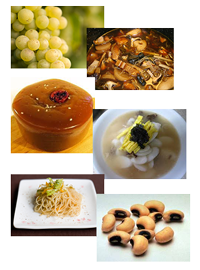 During the New Year’s holiday, we also have Japanese nishime (stew of chicken, lotus root, carrots, taro balls, bamboo shoots and shitaki mushrooms), Chinese gau (steamed rice mixed with Chinese slab sugar, peanut oil, and topped with a jujube), and Korean duk gook (rounded rice dumplings shaped like coins in soup). Noodles are also a staple (symbolizing long life). And, we can’t forget the Southern tradition of eating black-eyed peas! Just as we nourish ourselves to start the New Year on the right foot, your business needs its own “nourishment” too. Just as we feed our bodies for continued energy and growth, your business needs the same. When you start your corporation or LLC, filing your paperwork with the State is not enough to avoid future issues of personal liability. At the onset, there are multiple steps to completely separating your personal liability from your company’s business liability. For more details, just request our FREE 14 point checklist for starting your own corporation or LLC. Fully documenting the transfers of money, assets, or other property from the company to you as the owner. Conducting an annualorganizational meeting AND documenting your meeting with WRITTEN minutes. Keeping an adequate balance between debt and equity. Want the whole Checklist? Contact Dodge Legal Group, PC for your Checklist and start 2013 right!